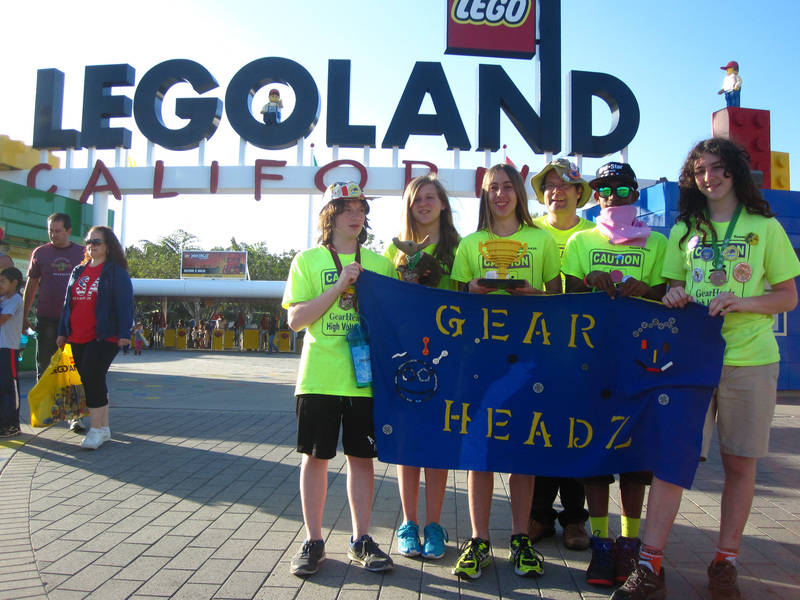 The GearHeadz with their trophy in Legoland California after the national competition. From left to right, the team members are Clayton MacKay, Jennifer Bradley, Jade Pinkenburg, Chris Pinkenburg, Rex Alex, and Julius Condemi. Their neon yellow shirts read “Caution: GearHeadz, High Voltage.” Their mascot is Ardvark*, the stuffed animal aardvark. And, they have all the Lego trophies they could want. 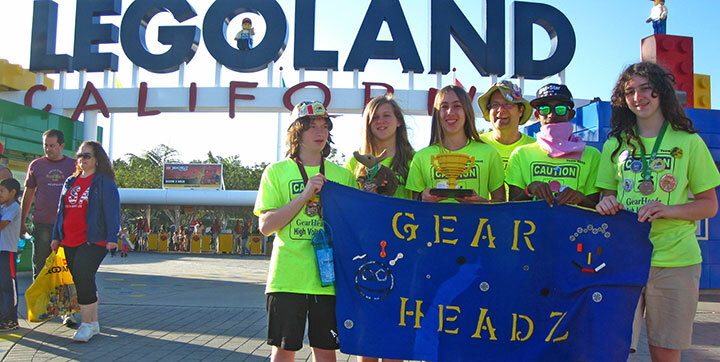 These 13 to 14 year olds are the GearHeadz, one of the top robotics teams in the nation for their age category. They have victoriously returned home to Rocky Point, New York, after receiving the second place programming award and placing fifth at the national competition in California. Helping lead them to this success is their proud coach, Chris Pinkenburg, a physicist at the U.S. Department of Energy’s Brookhaven National Laboratory. Pinkenburg formed a LEGO robotics team six years ago after attending an educational symposium at Brookhaven on the FIRST Robotics Competition. The team then underwent a few name changes before settling on the name “GearHeadz” three years ago. As a scientist, Pinkenburg knows firsthand the value of excitement in sparking an interest in science and engineering. He spends his workdays at Brookhaven coordinating offline computing for the world-class PHENIX experiment at the Relativistic Heavy Ion Collider and working on the simulation effort for the sPHENIX upgrade. When he heard at the symposium about the FIRST LEGO League for kids aged 9 to 14, he knew it would be the perfect place to nurture students’ passions in science, technology, engineering, and mathematics (STEM). The initial team consisted of four interested kids from his eldest son’s fifth grade class, while Pinkenburg also embarked on a parallel effort to get the program started at the local middle school. Team members Jade Pinkenburg and Rex Alex with the team's robots in the finals at the FIRST LEGO League Long Island Championship Tournament. The competition places an emphasis on having students drive their projects forward. Only they are allowed to speak with referees and judges. 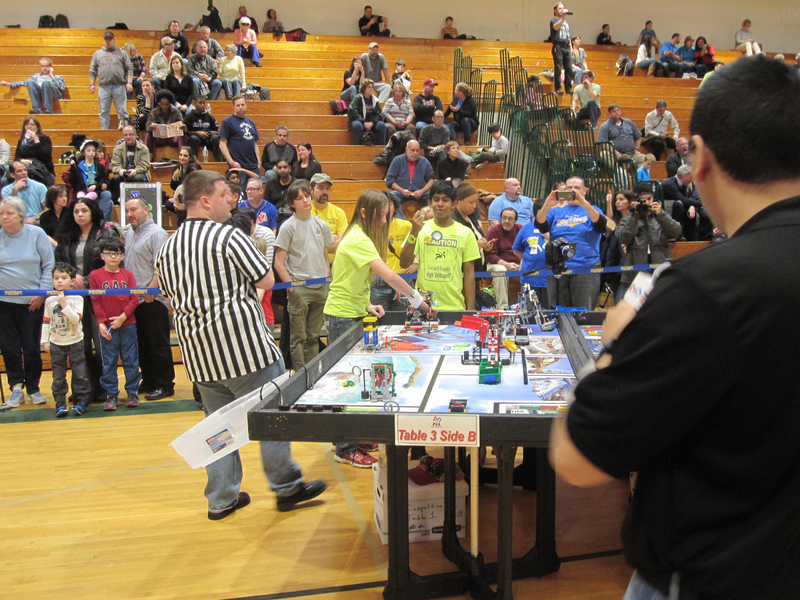 While coaches and parents support the teams, the kids build and program the robots themselves. There are three parts to the competitions. 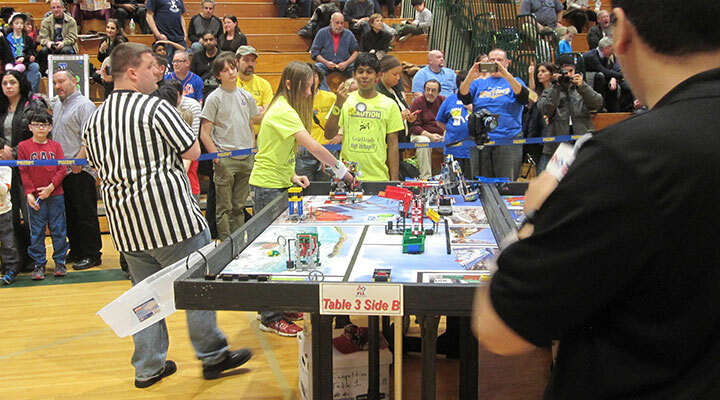 For the robot game, the team builds and programs LEGO robots to fulfill tasks on a playing field. They also create a project that solves a real world problem related to the theme of a given season. This year’s theme was "Trash Trek." To prevent the deaths of sea turtles that accidentally ingest plastic, the GearHeadz developed a digestible bag made from a starch-based plastic. As an added social component, the team earns points for how well they work together and answers interview questions on how they apply the core values of respect and cooperation to their everyday lives. After six years of competitions and meeting twice weekly for two hours each, the GearHeadz have gone from learning from the other teams, to teaching them, Pinkenburg notes. “I am enormously proud of the team. It's amazing to see their development over the years and how confident they’ve become in their own abilities,” he said. When the students talked to the Times Beacon Record after the California competition, they showed appreciation for their coach. “He’s a really nice guy who knows so much. He’s a great coach, and I’ve really enjoyed being a part of this team,” said Clayton Mackay, who joined the GearHeadz last year. Moving forward, Pinkenburg is considering starting a North Shore community-based team for the FIRST Robotics Competition (FRC), designed for older teens, with the GearHeadz as the nucleus. “This is a huge challenge, and it's not clear if we'll manage, but being part of an FRC team has been my dream ever since I listened to the FIRST presentation six years ago,” he said. For his community involvement, Pinkenburg was named a 2015 Times Beacon Record Newspapers Person of the Year.